When you’re selling a SaaS product to a potential customer, you have to convince them switching is worth the effort. And once you’ve sold the product, you have to do the opposite: convince the customer that switching to anything else isn’t worth it. In chemistry, there’s a notion of an activation energy. A Swedish scientist Svante Arrhenius coined the term to describe the minimum amount of energy required to start a chemical reaction. The drawing above depicts this idea. How does this idea apply to SaaS? Successful sales teams reduce activation energy. Great customer success teams increase it. First reduce switching costs, then increase them. SaaS buyers consider many different types of costs when contemplating a switch. All of these factors contribute to the inertia of staying with the current vendor. First, the political and social capital cost of championing a change. Salespeople are in the business of selling promotions. But, a bad deployment can have the opposite effect and seriously limit an internal champion’s career. Second, the opportunity cost. Changing CRM, ERP, marketing software, customer success software has many soft costs. All the data from the old system needs to be migrated. Teammates must be trained. Productivity will decline during the transition. Not to mention the time involved in educating and convincing internal constituents to change. Third, financial risk. If a new billing system fails for a few hours, the company loses money. A new hosting provider, a new analytics vendor, a new email marketing platform - failure in any of these products hits the business’ top line. Fourth, functionality costs. Switching to a new vendor might have some benefits, but I may lose some functionality the team values. This is why there’s a mantra that a product has to be 10x better. For many possible internal champions the rewards bearing these risks and costs must be justified by substantially larger gains. After a customer is won, the customer success team is on point to retain that customer. Behind the scenes, the product and engineering teams improve the product to support the CS team. Their shared responsibility is to increase the activation energy and startups take many different approaches. building a relationship with their champion. In many cases, relationship capital often “saves” customers from churning. Customer appreciation events, user conferences, gifts are all examples of this. These are just a sampling of the ways startups increase switching costs after the sale. How a company does it often reflects its values and culture. 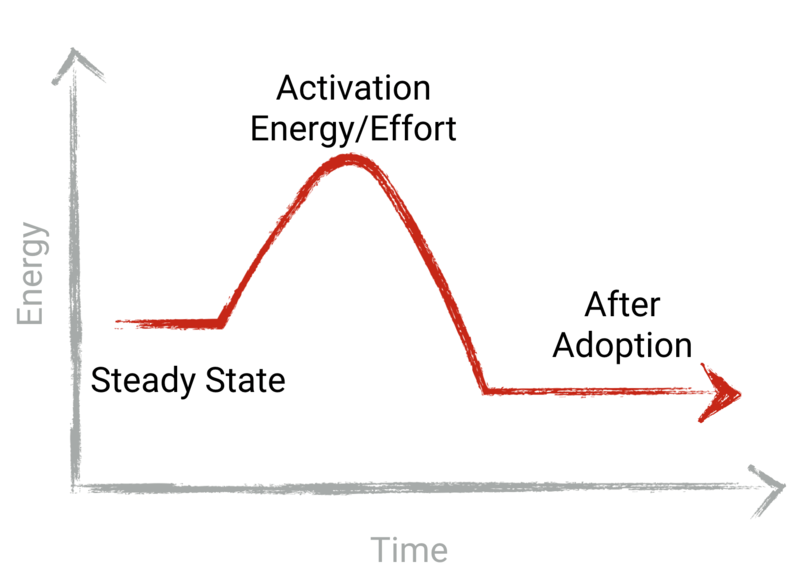 Activation energy and inertia are things to understand in the sales and customer success functions of SaaS companies. I bet my Chemistry teacher never thought I’d say that!